One of the coolest things about nature is that it thrives if you show it even a little love. Nature is resilient. It’s true that plants and animals need big spaces like nature preserves and state parks to keep their populations healthy, but even small green spaces can make a difference by providing more places to set roots, raise their young, and find food. This also benefits people, since we all depend on healthy populations of pollinators like bees and butterflies for our food supply, as well as clean drinking water and air that is free of pollutants. Your backyard, community garden, or balcony can be a friendly home to wildlife of all types. Here are some tips to help plants, animals, and bugs in your area. Abby Henkel, Sycamore’s Communications Director, keeps beehives to help pollinate plants in her neighborhood. And the honey is second to none! The four main components of a habitat are food, water, shelter, and places for animals to raise their young ones. 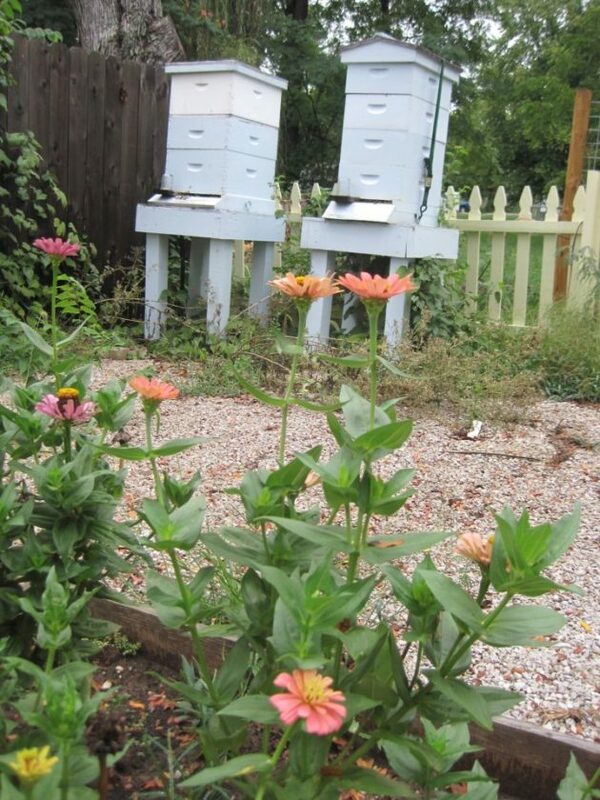 Food: Plant native plants like milkweeds and wild columbine for monarch butterflies or coneflower for bees. Virginia creeper grows easily and provides wintertime berries for birds. Water: Even a pond just three feet deep can be big enough for frogs to burrow in winter. Be sure to install a fountain or filtration system to keep the water flowing, not stagnant. These can be purchased pretty inexpensively. Healthy beehives need to be within 1/4 mile of a fresh water source, and they love small ponds and creeks. If you don’t have room for a pond, put out a small bird bath and keep it full of clean water. You’ll see all types of songbirds coming over to wash up and take a drink. Shelter: Among other types of dense shrubs and trees, prairie dropseed feeds sparrows and provides nesting cover for small animals. Trees provide homes for hundreds of species of animals and insects, and they can also help lower the heating bill on your home when planted nearby the house to provide shade. Simple features like rock piles and brush piles provide great cover for small animals. Safety: Birds will take advantage of birdhouses you set out. These are great places to lay eggs and keep them safe. Implementing simple sustainable practices, like limiting pesticides and preventing soil erosion, help keep the plants healthy to provide good sources of food for many generations. Try implementing a rain catchment system to reduce water usage by reusing the water you already have. Channeling it from your rooftop into a rain barrel is a great way to do this. In your garden, plant cover crops to help keep the soil healthy and reduce weed growth over the winter. Raking leaves and removing dead flower stalks might make your yard look pretty, but it also removes seeds that birds like to eat. Lower the tidy factor just a little bit to help animals get what they need. 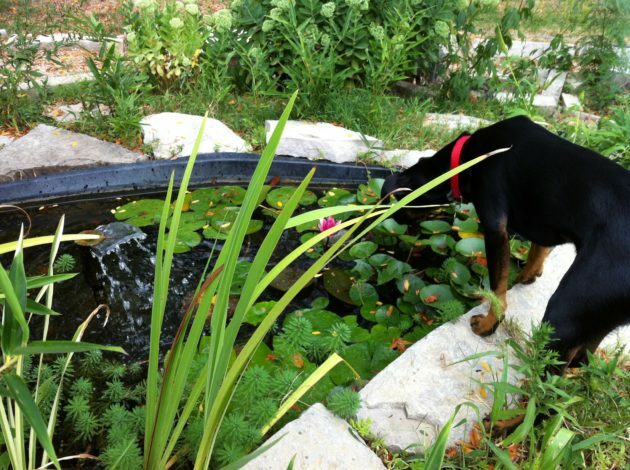 All kinds of animals visit Abby’s pond, including her curious dog, Jackson. Once you’ve developed the four main components that make up a good habitat, you can get it certified by the National Wildlife Federation. The prairie in front of Sycamore’s headquarters in Bloomington has this designation.